Clerkenwell Design Week 2018 just wrapped up with a three-day, jam-packed schedule where we found ourselves hopping all over the place to get you the best of what it’s ninth edition had to offer. Like every year, the trendy district of Clerkenwell was buzzing with excitement, adorned with installations, exhibits and brands, welcoming the public to their showrooms. Without further ado, here’s what we loved about this year’s Clerkenwell Design Week. Created by Kinetech Design in collaboration with Amari Interiors and Timberfusion, this stunning piece was placed at St. John’s gate, a remnant of Clerkenwell’s monastic past. It was in this place that a host of Shakespeare’s plays were piloted. Kinetech Design has drawn on the history of the arch and showcased their strong Kiri-origami style, in a structure that mirrors an Elizabethan ruff. For a third consecutive year, Scale Rule’s Next Generation Design Pavillion was the headline at Clerkenwell Design Week 2018. The eye-catching installation was designed by a winning group of 13- to 16-year olds, mentored by architects from Grimshaw and engineers from AKT II. Using the metaphor of layers, delicate pieces of string were used to produce a layered, geometric design at the top of the structure. Visitors were invited to look up into a kaleidoscopic pattern, symbolizing the next generation’s optimism for the future. It was a mesmerizing few seconds staring at the installation. Now, this was an experience worth checking out. 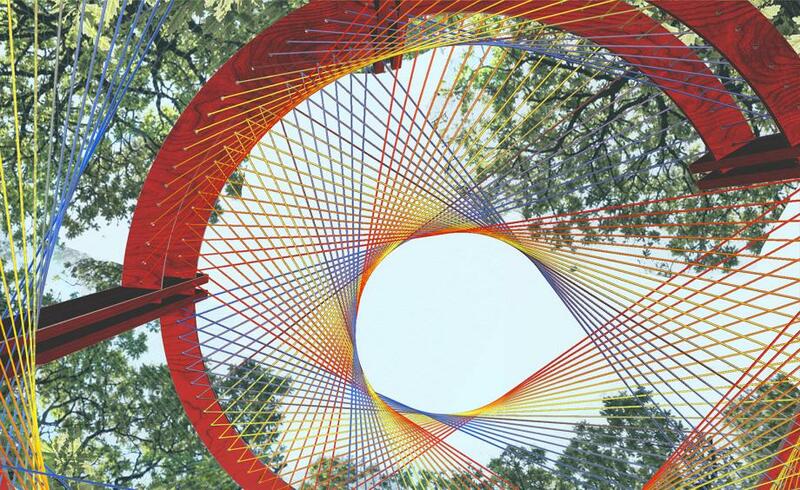 Designed and created by award-winning Swiss architect and designer Stephan Huerlemann from Sky Frame, this thought-provoking installation was on view in the garden at St James Church. The installation aimed to bring out positive feelings amongst visitors by telling a story about the sky and being in an orbit. Visitors would step in front of the hexagonal mirrored funnel, and with the press of a button, be transported away from their hectic daily lives to a zone where one can think, and even dream, in peace; although, for just a few seconds. While the light reflected from external spotlights creates a huge sphere inside the funnel, the appearance of the sphere changes as the colour of the external spotlights change. Therefore, visitors to the installation were presented with a view of the earth from space and were able to view the sky from a different perspective – from above. The sound concept further emphasizes this idea, as the background for the installation was the sound of the earth. 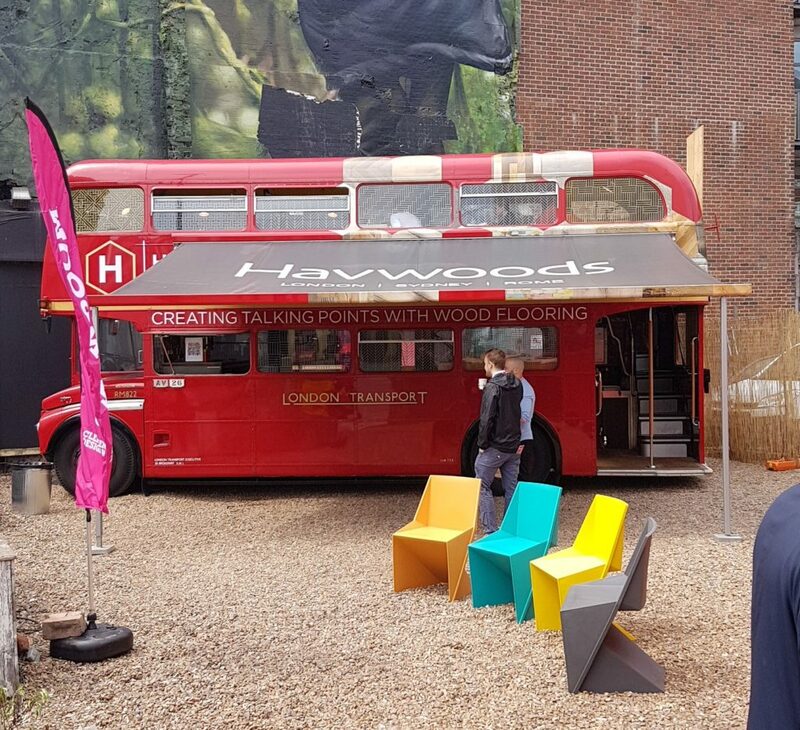 Visitors to Clerkenwell Design Week 2018 were welcomed by the ‘Behind Closed Doors’ – an interactive installation created by Hakwood in collaboration with Shape London. The 3.2 m high installation designed and fabricated by Shape London featured a miniature street-scape that draws inspiration from the Dutch home of Hakwood as well as Shape’s South East London Design Studio. Located at the entrance to Spa Fields, in close proximity to the Exmouth Market area, visitors could walk through a pop-up street scene of tall townhouses. The decorative houses were clad with Hakwood Wall Tiles with each house having its own unique pattern and sharing the same colour palette. Each house included a small door revealing a series of miniature interiors designed by various architects from Shape’s DragonFly Place Collective; demonstrating that any interior and any décor is an open door for creative inspiration. Sure, height-adjustable tables are commonplace these days. But the Tilt table by Edsbyn is a novel concept – a height adjustable desk with a tiltable top. We got a chance to try out the prototype at their showroom, and there’s no doubt Edsbyn has got something cool on their hands. With all the buzz (pun intended) about reducing and controlling noise in the workspace, Edsbyn poses an alternative question: Is it possible to add sound to reduce stress and improve the ability to concentrate at the workplace? A research project with Doctoral candidate Martin Ljungdahl Eriksson aims to answer this question. Today’s open offices and meeting spaces create great environments; but at the same time, noise is a growing problem. In this research Edsbyn and Martin Ljungdahl Eriksson address this issue through personalized dynamic sound environments that create invisible spaces in the room. The Sound Bubble has in-built speakers that play music, tuned at a certain frequency, and is designed to create a sense of calm and eventually productivity. Beautifully simple and simply unique! 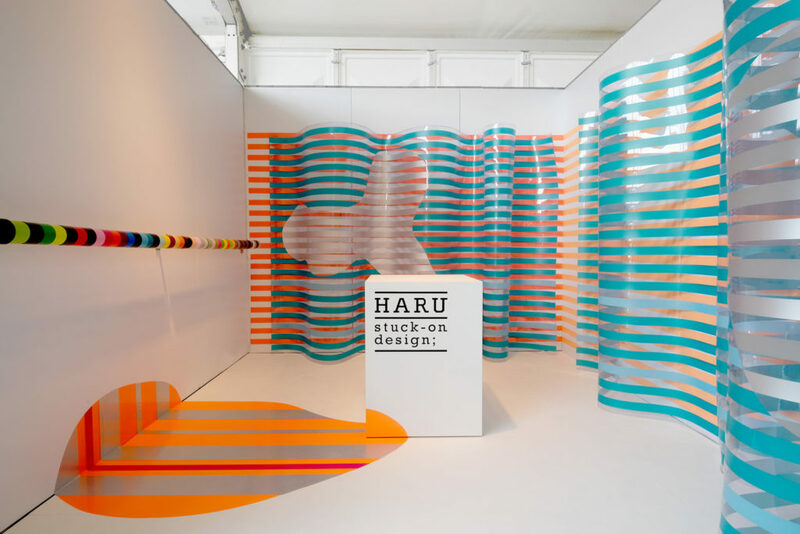 The award-winning brand Haru is an adhesive tape that’s an easy way to introduce colour into an interior. And to create art wherever you go. It adheres to all kinds of different surfaces and is just as good on furniture as it is on walls or floors. Moreover, it’s easy to remove. Its special adhesive leaves no trace at all. The HARU philosophy is based on 8-colour families that allow for new methods of expression. A combination of different colours, patterns and textures never seen before in such variety that it offers many new possibilities for creativity. Who doesn’t like a good tote bag freebie? On display were several trendy versions of the popular tote bags – a great expression of creativity on a simple canvas. 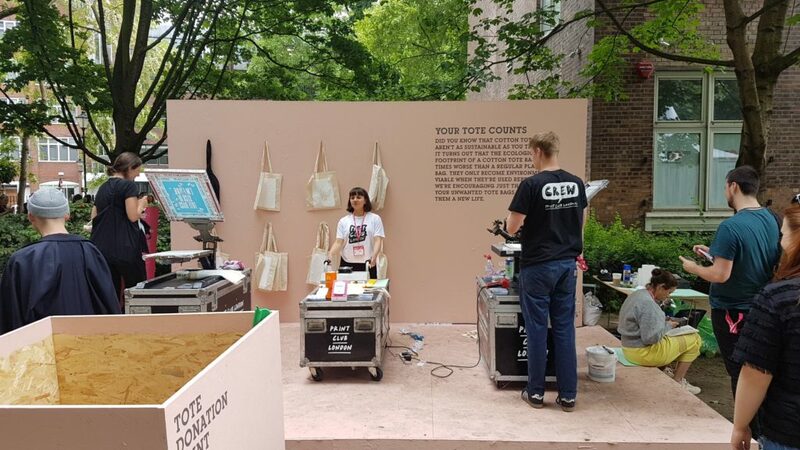 On a parallel but important note, an interesting project named ‘Your Tote Counts’ by the Print Club London and the Chelsea College of Art was presented to the general public at Clerkenwell Design Week 2018. #YourToteCounts intends to address the issue of the surplus tote bags replacing unsustainable plastic bags. According to the UK Environment Agency (UKEA), the ecological footprint of a cotton tote bag is 327 times worse than a regular plastic bag. 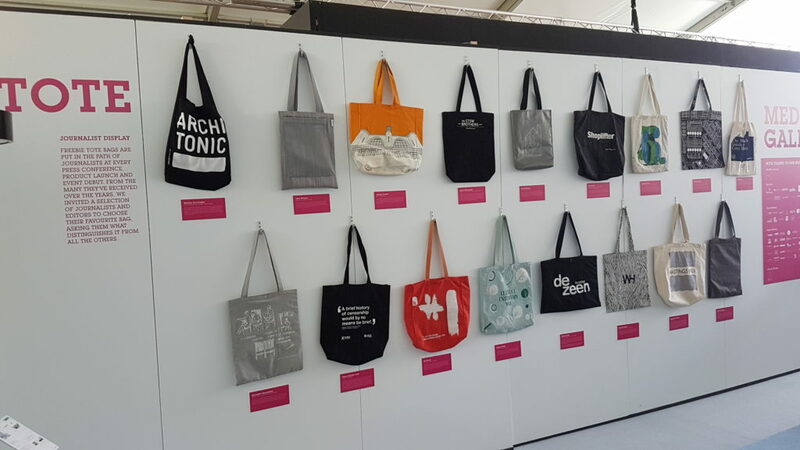 To address this issue, students from the Chelsea College of Art set up an installation in collaboration with Print Club London to encourage the reuse of old totes. Visitors could give “new life” to their unwanted totes by taking them to the installation and getting them customized with designs created by the art students. Contemporary interior textile producer Casalis presented their Architextiles collection at the Clerkenwell Design Week 2018. The signature collection – a 3D woven, acoustic panel – the ONDO was the latest addition to the Architextiles’ series. It is also available as full-wall panels, a patchwork of varied colour and shape combinations, room dividers and suspended room dividers. Together with their sound absorbent qualities, the ONDO offers the possibility of integrating power sockets and screens making it an excellent choice in public spaces such as offices, airports and restaurants. Turkish furniture manufacturer Koleksiyon really stepped up the cool quotient this year. Their space was host to work by Finn Stone – the product designer turned art norm challenger of Irish Heritage. The artwork on display was nothing short of eccentric and stunning – testament to his flamboyance and overzealous imagination. 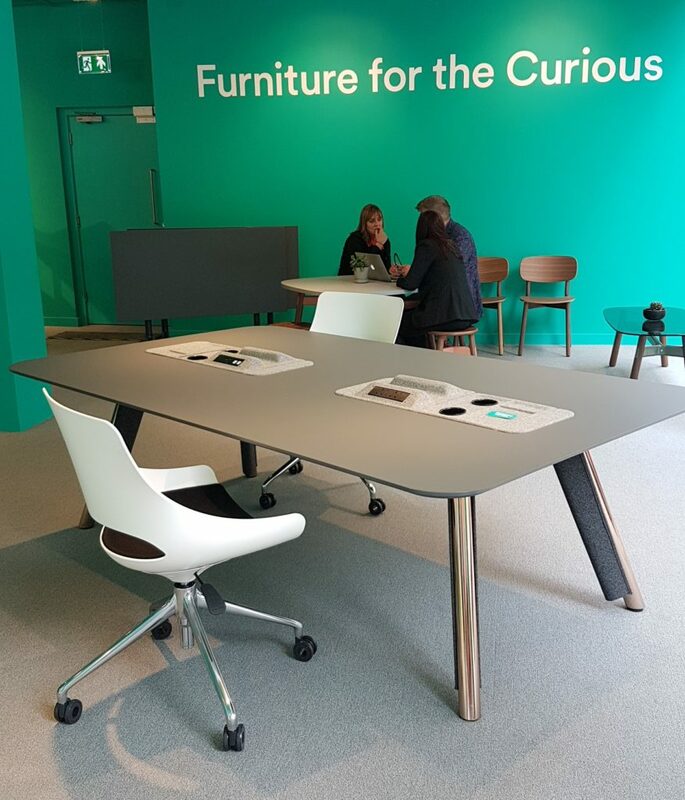 A special shout-out to the good folks at Clarus who celebrated their first appearance at Clerkenwell Design Week 2018, since officially opening its London office. They partnered with Koleksiyon and donated mobile, writable glass boards to children hospitals in the UK during a “go! for Gold” event. At the heart of the Orangebox is the Smartworking principle, and their collaboration with Ideapaint is a testament to this. The dry-erase paint pioneer shares the bottom most floor of the Smartworking showroom, with their dry-erase walls for all to see and use. During Clerkenwell Design Week 2018, graphic designer and photographer Aidy Brooks was taking requests for the stunning work of art you see below. 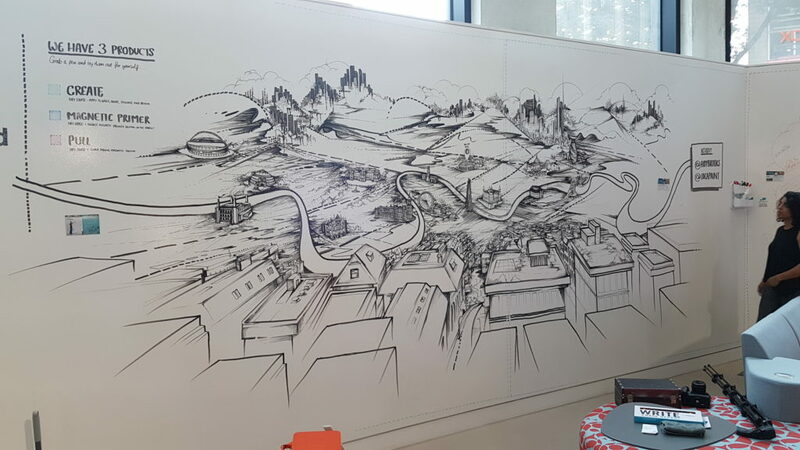 Using IdeaPaint’s CREATE painted-wall as a boundless canvas, Aidy created an interactive scene of London and Boston’s skyline on the magnetic and dry erase wall! Having relocated to an impressive new showroom in Dallington Street in the heart of Clerkenwell, Bisley – the British storage specialists – had to make a statement to those visiting their new space. This exhibition explores how human storage needs have changed in contemporary times and in this age of digital media. The featured works included those by Sam Jacob, Jurgen Bey, El Ultimo Grito, Parsons & Charlesworth, Tobias Revell, Birgit Severin, Talin Hazbar, Aric Chen, Jo Anne Butler and Théophile Blandet. Each contributor was asked to put forward an object that they thought encapsulated 2018 and considered important to carry forth. The programming code for Fake News in physical form. One of the entries into Bisley’s Time Capsule. Global modular flooring manufacturer Interface showcased how +Positive spaces™ make for happier people and created a healthier planet. Among the many new products was their latest collection – LVT. It also included some really cool workshops, notable among them was the Kokedama – a Japanese variant of bonsai; and not to forget the awesome green smoothies served round the clock. Allermuir – Stop, Collaborate, and Listen! 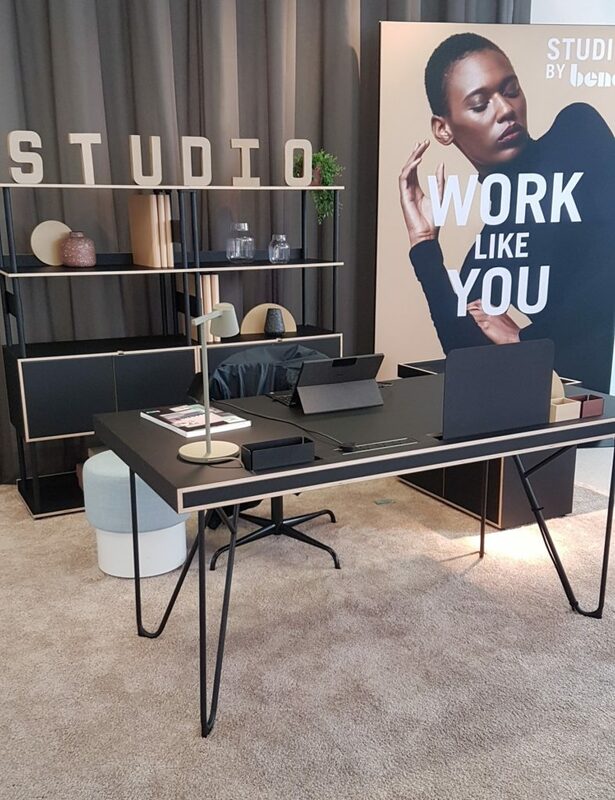 Clerkenwell Design Week 2018 was a special one for Allermiur, as they opened a stunning new creative laboratory for the first time to visitors. The opening coincided with a new look for the brand, the result of which feels impeccably sophisticated while at the same time retaining a youthful and witty perspective. The design-driven brand showcased collaborations with the likes of PearsonLloyd, Mark Gabbertas, Wolfgang C.R. Mezger and Benjamin Hubert. On display was Axyl, the result of their first collaboration with London-based designer Benjamin Hubert and his studio, Layer. We were treated to an immersive installation involving the chair and stool floating in their component parts. Axyl utilizes a strong geometric design language that is entirely original yet draws on familiar references, such as the A-frame typology and Mid-Century Danish wrap-around shell. 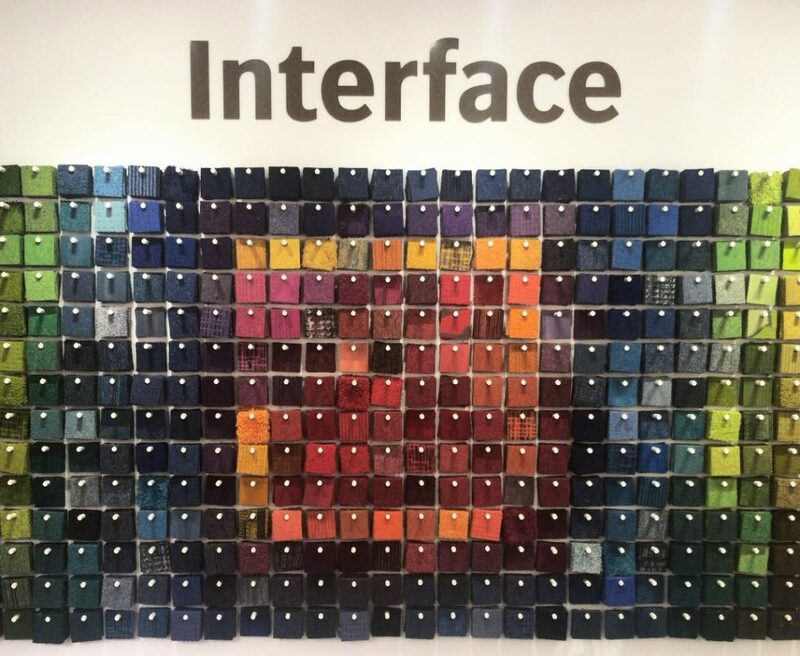 Contract Fabric specialist Camira set up an educational display that gave visitors an insight into the textile landscape, tracing the origin of its raw materials, through the complex processes of textile manufacturing to create the materials that transforms our interiors. 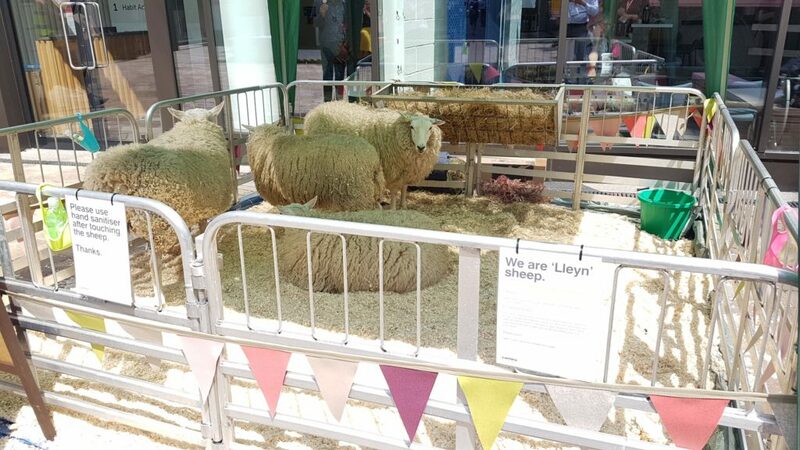 London is no doubt an interesting city, but it’s not every day you see sheep and lamb on the streets of Clerkenwell. The animals were an obvious pointer at the source of their materials, as well as their new range – Blazer. 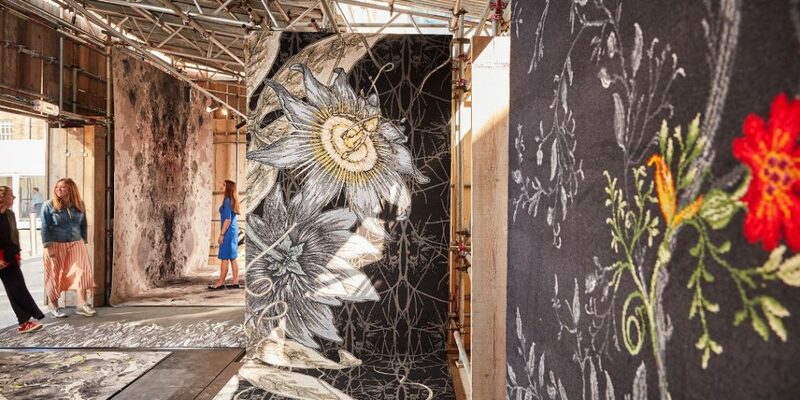 The installation objective was to show how the beautiful fabric is made, starting with the wool fibre from the sheep through to the finished product. And to add to the interactive experience, was a handloom on which we were allowed to try our hands. Brinton carpets launched their eagerly-anticipated ‘Craigend Collection’ at Clerkenwell – a nod to the road name of the Glasgow TB studio and the birth-place of the collection. But inspiration also comes from the Old Gaelic word – Creag, meaning rock. The collection is inspired by textures or surfaces found on the ground, including the sand dunes, stone moss and aerial views of landscapes; all reimagined in Brintons special 80/20 blend of 80% wool and 20% nylon. The carpet manufacturer did a great job of housing their collections too, with the installations made from wood planks to create a rugged, workshop look. 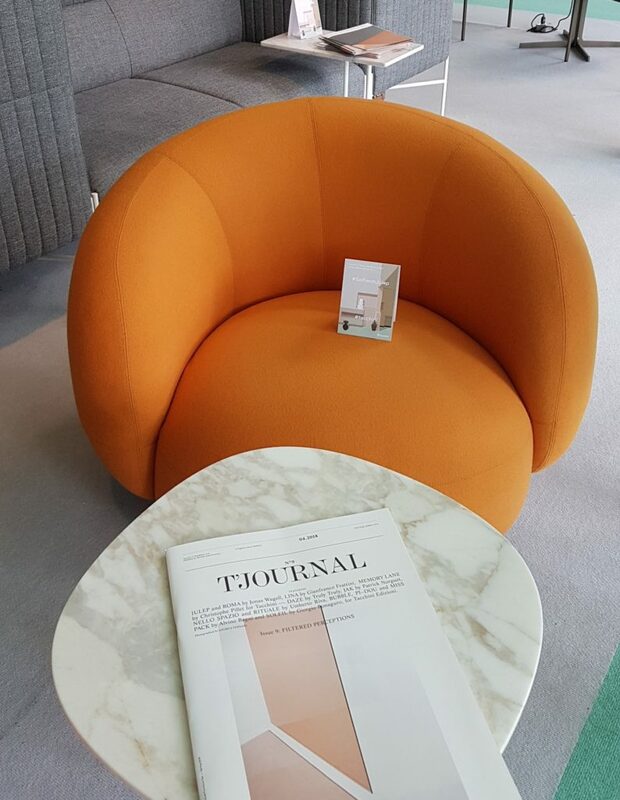 Arper‘s always got a strong presence at Clerkenwell Design Week. If you need proof of their popularity, just check out the line to their party the next time you visit. You’d think it was a new iPhone launch! While we were definitely at the party, we did make sure to pay a daytime visit to their showroom to check out KIIK – a modular collection of seating, tables, ottomans and consoles. Design by the Iwasaki Design Studio, earlier this year, Kiik enables one to create moments for working, gathering or relaxing in graphic forms with myriad configurations. On display at the Frovi showroom was their new ranges of social space furniture. The brand new products showed a range of alternative materials not normally used to create stunning furniture solutions. We saw a range of concepts coming to life with the scope to mix and match colours, fabrics and frames, to create truly tailored furniture options from within the Frövi range. 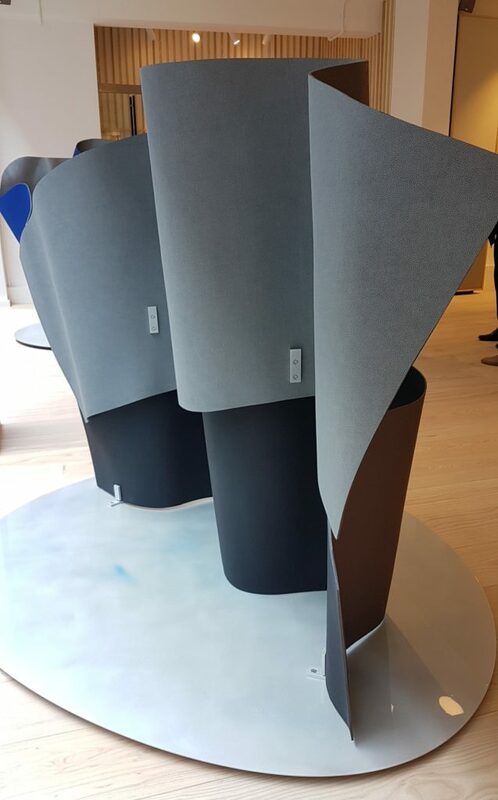 While this is just the highlight reel of our 3 days in London, it’s definitely a list of what we loved at CDW 2018. Check out some more cool stuff we spotted around Clerkenwell. We had the pleasure of visiting Clerkenwell Design Week for the past number of years and its a fabulous display of creative talent, inspiration and furniture.